Opprobrium actually started life as Incubus. No, not the band whose name you were cursing the 10,000th time you heard “Drive” on the radio back in 2002—this Incubus was an early American death-thrash group who drew comparisons to Sepultura with their two classic albums, 1988’s Serpent Temptation and 1990’s Beyond the Unknown. Brothers and founding members Moyses and Francis Howard even share Sepultura‘s Brazilian heritage and were inspired to write a third album after a trip to their homeland in 1999. 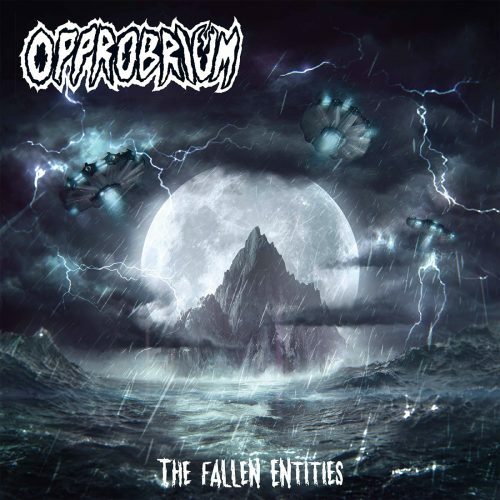 This ultimately resulted in a name change to Opprobrium to prevent a legal conflict with the other Incubus.1 The Fallen Entities marks the duo’s fifth album overall, third under the Opprobrium name, and first since 2009’s Mandatory Evac. Three decades into their career, do these olde death-thrashers still have what it takes? For the most part, yes. Entities largely upholds the sound of the group’s past works, with Francis’s thick meaty guitars and strained gruff roars leading the charge. Moyses’ drumming varies between burly grooves, thrashy outbursts, and lurching mid-paced rhythms, though in all Entities is noticeably slower than previous albums. The overall effect reminds a lot of Florida’s Solstice, which ain’t a bad thing. Opener “Dark Days, Dark Times” sells the formula early by working in a catchy chorus riff and accompanying shout-along lyrics (“Dark days, dark times!”), while second track “Creations That Affect” is sure to get heads bobbing with its snappy melodic thrash break. 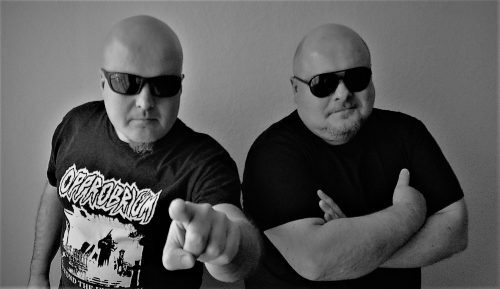 Late highlight “Turmoil under the Sun” shows these brothers haven’t lost an ounce of muscle in their time away, striking with the blunt force of Demolition Hammer and then continuing to swing through measured grooves. It’s a solid approach even if Francis’ riffs aren’t always the most memorable. The songwriting frequently shifts between riffs and rhythms with little repetition, making these eight tracks feel quite involved and adventurous for a style more renowned for its direct nature. The result is an album that’s fun to explore and revisit, even if minor flaws reveal themselves along the way. “The Fallen Entities” bobs on cool muted tremolos before venturing off into other interesting ideas, though it’s unfortunate that it never returns to its strong opening riff. On the flip side, “Wicked Mysterious Events” initially feels lacking in hooks, though multiple listens made me realize the song’s eerie repeated tremolo line is actually pretty neat and fits well with the track’s paranormal themes. There isn’t a bad song here though “Throughout the Centuries” feels too long at over seven minutes, even if its thrashy midpoint is a welcome treat. Performances are tight and it’s clear these brothers have been playing together for years. While Francis’ inflection and vocal patterns get a little repetitive by album’s end, his guitar playing is quite varied, utilizing everything from tremolos to beefier chords to progressions that call to mind Death‘s Spiritual Healing era. The man’s solos also have a lot of character, with closer “Obstructive Behavior” featuring a particularly glorious and soaring example. With plenty of shred, wahhing, and flashy melody, his leads make an already good album even better. The production only helps things, with dry and hefty guitars propelled by a sharper-than-usual snare sound. It’s always great to see a veteran band return with a good album, and that’s certainly the case with The Fallen Entities. While a few minor issues keep this from outshining their older works, Entities is nonetheless a potent example of old school death-thrash done right. Fans of Solstice, classic Sepultura, or even newer acts like Skeletal Remains are sure to get a swift kick out of this. The riffs are simple yet effective while the songwriting is surprisingly complex, and it’s made all the better by lyrics which run the gamut from socially conscious (“In Danger”) to ancient alien conspiracies (“The Fallen Entities”). Whatever name these brothers call themselves, I’ll be eager to check out what they come out with next. Whatever tomorrow brings, I’ll be there.